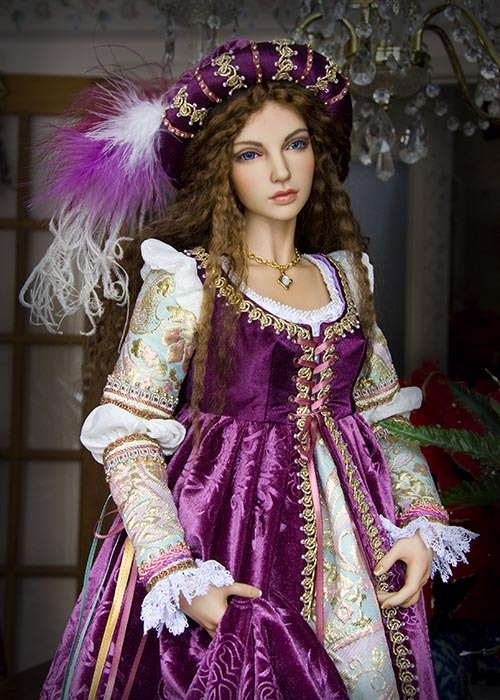 ​ although the bodice is a little looser on both of them. 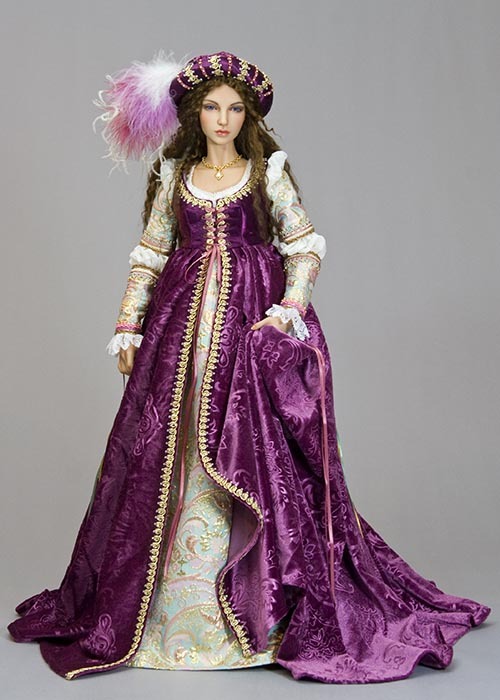 The dress was inspired by gowns worn during the Italian Renaissance, and is not intended to be historically accurate. 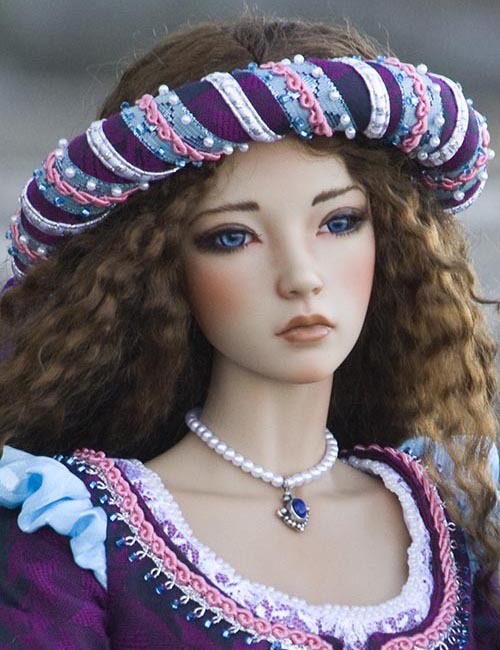 Patterns were drafted to recreate the 'look', on a modern BJD, in as simple, and easy-to-sew, design as possible. Print out the 6 pages of patterns, and cut them out. 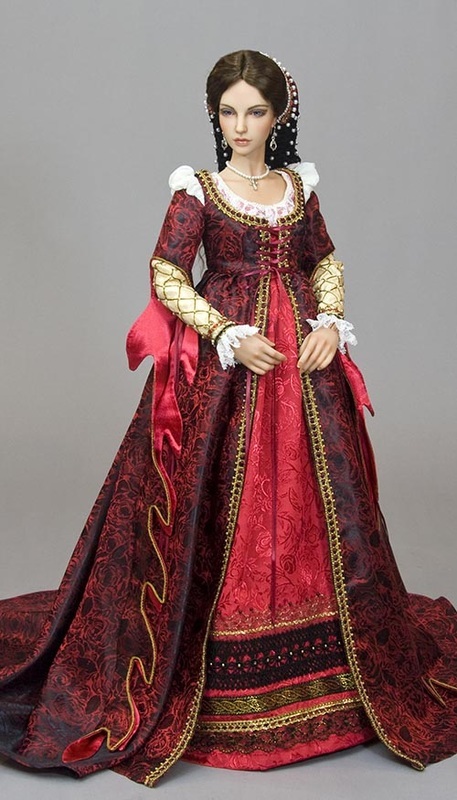 *Unfortunately I do not have under-construction photos for the actual EID Renaissance gown, however I did take photos when I made the exact same gowns in SD size - although not until after the underdress bodices were already made. 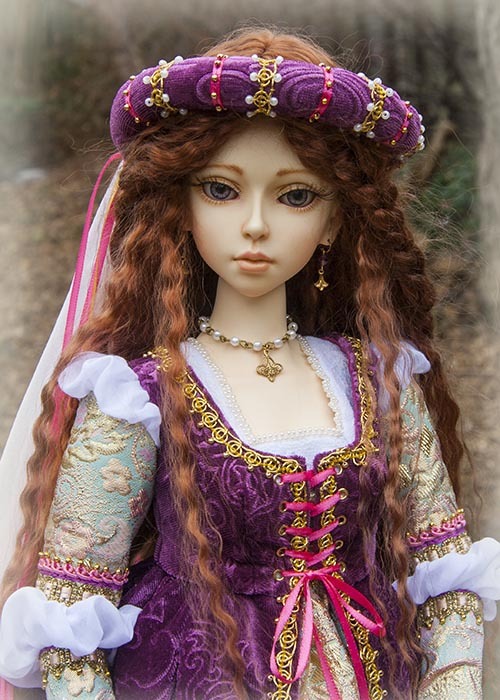 So I will do my best to explain the process verbally, using photo examples from the SD Tutorial and other projects, as well as close-ups of the finished EID gown. So I hope you won't be thrown off when photos of a particular step are not of the same colour dress as in a previous step. 4. Stitch both armholes seams. Clip all corners and curves. 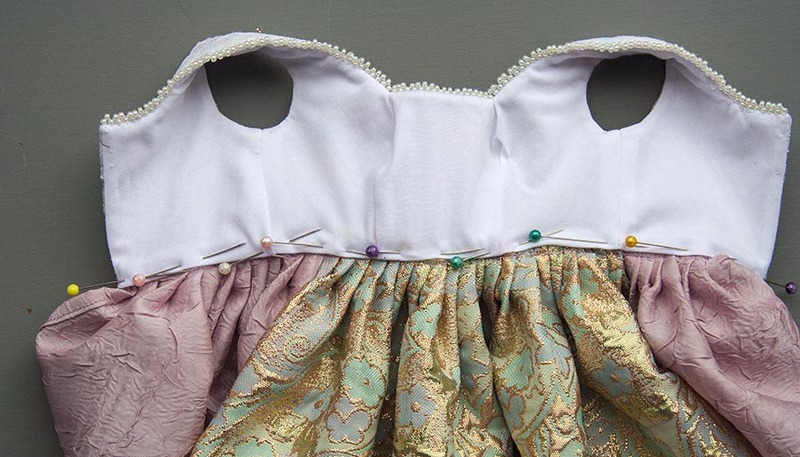 Turn right side out by pulling bodice backs through shoulders to front. 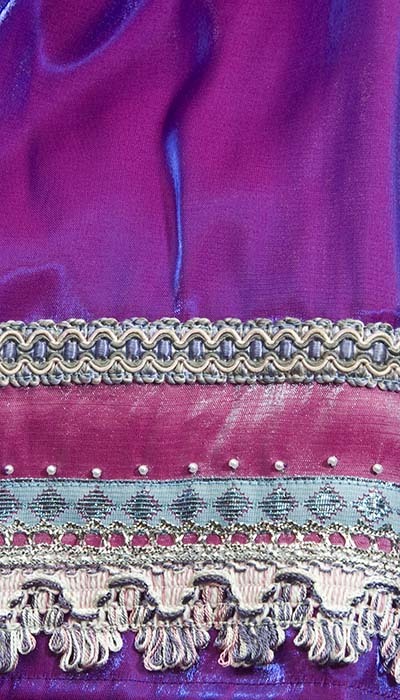 ​*Note - the SD skirt in the photos is two-tone because I didn't have enough of the turquoise brocade left for the entire skirt (after making the EID gown) so it's just in the front, where it will show, with the pink fabric added on either side for fullness. 1. 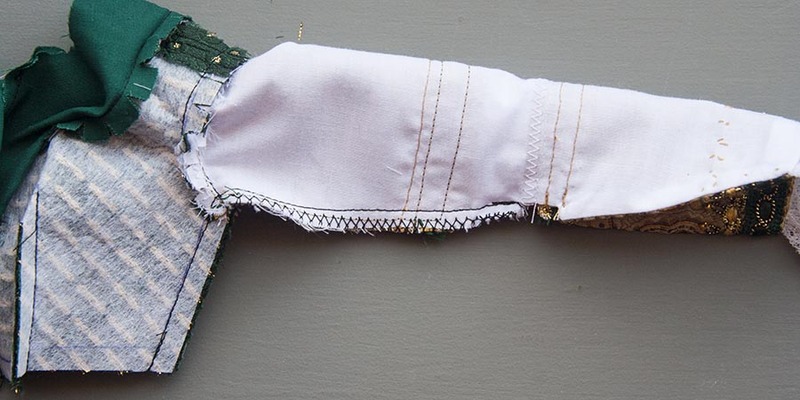 Fold skirt fabric in half along a selvedge. 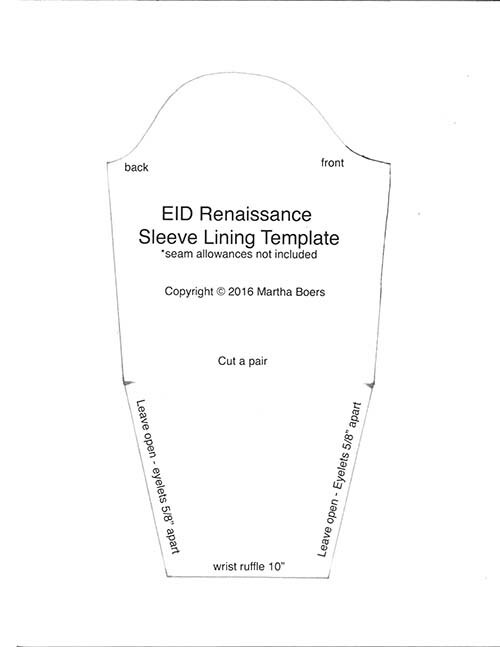 Cut out the large curved pie-shaped piece on the 'EID Over Skirt Cutting Diagram' page, and position it on the fabric as illustrated, with the long edge of the pattern along the fabric fold, and the shorter end along the finished edge of the fabric. Pin in place. 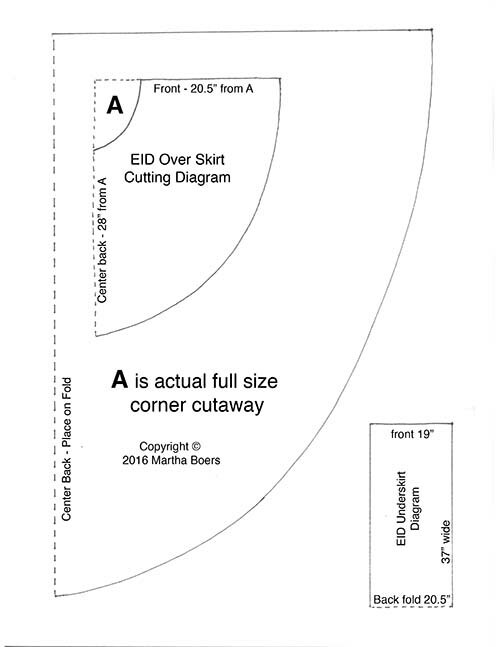 For the front edge of the skirt, measure an additional 20.5 inches away from the curved central cutaway piece. Mark with pin. Then measure an additional 28" further along the folded edge of the fabric. Mark with pin. 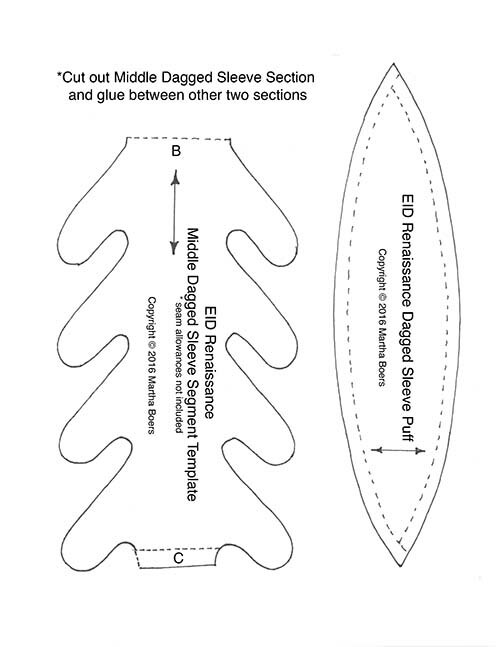 ​*To make a fuller overskirt, enlarge the central cutaway pattern, and measure the skirt from that as before. 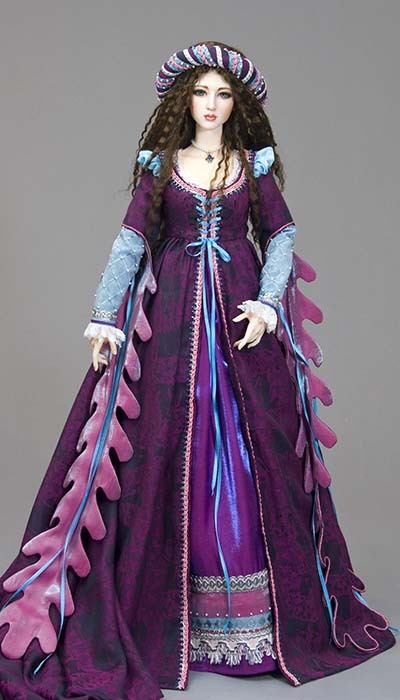 *Note: I will be using the construction photos from the SD version, however the sleeve patterns are a little different. 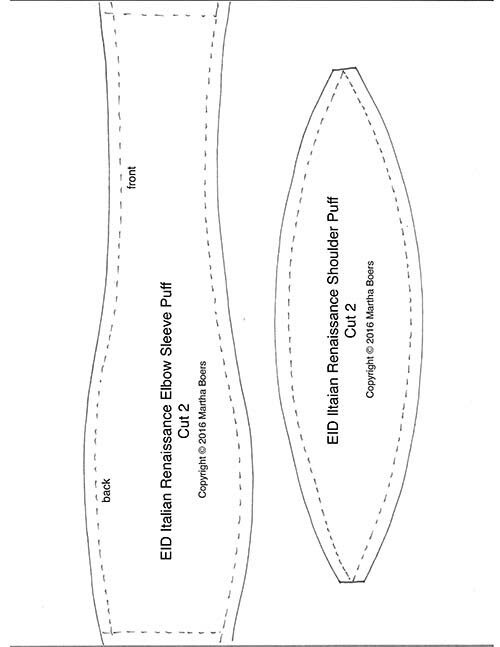 The SD sleeve patterns allow for an overlap of the seams so the sleeves below the elbow can be done up with snaps, with just a ribbon tie at the wrist. 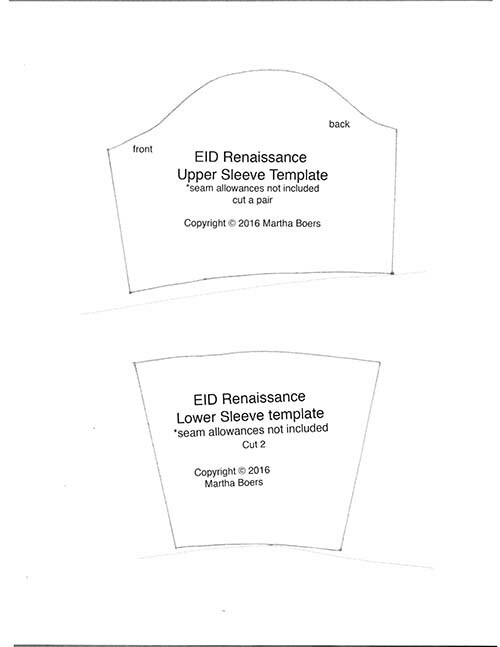 The EID lower sleeve pattern differs in that the sleeve is a closer fit and will be laced up through eyelets. 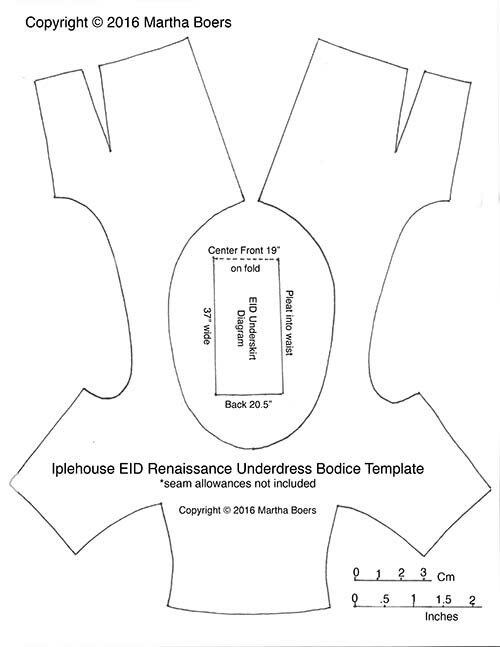 So the EID pattern has 'straight' sides and does not have that 'bump' on the lower half like the SD pattern. 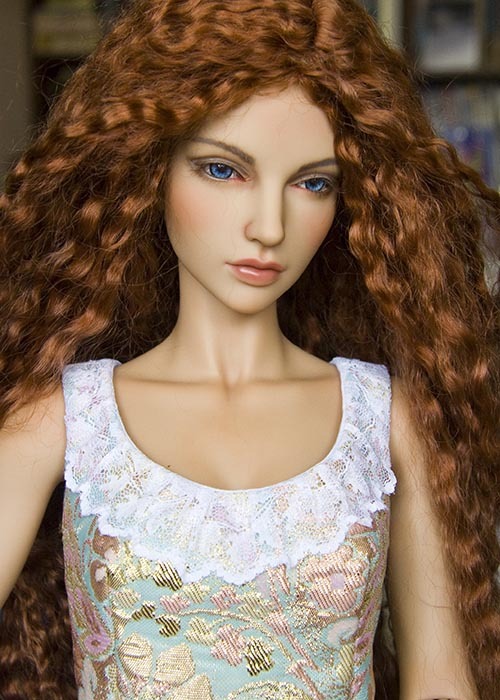 Please try ignore that detail in the photos. 1. 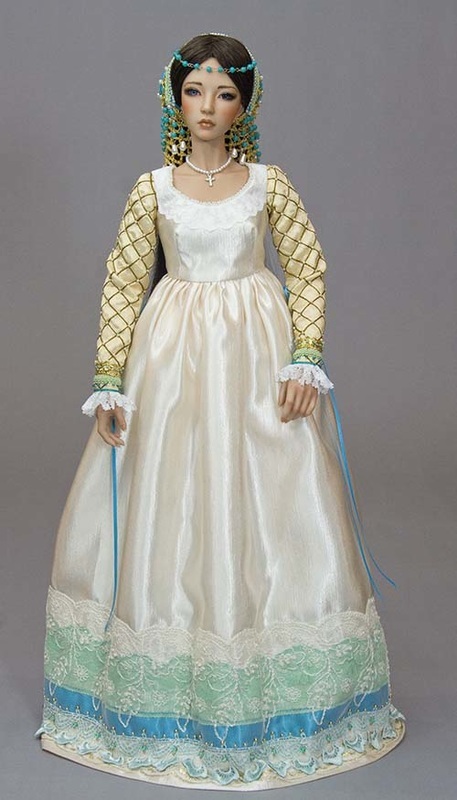 Cut out all the sleeve pieces; cotton lining, cotton puffs, and brocade upper and lower sleeves. *The elbow puffs can be cut wider if a fuller puff is desired. Use FrayCheck along all edges. 6. 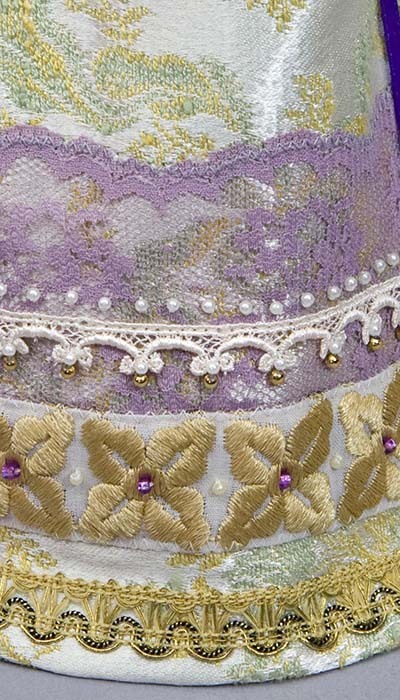 Stitch side seams to mark on pattern. Clip seams and turn lower sleeve right side out. Pin and press flat. 17. 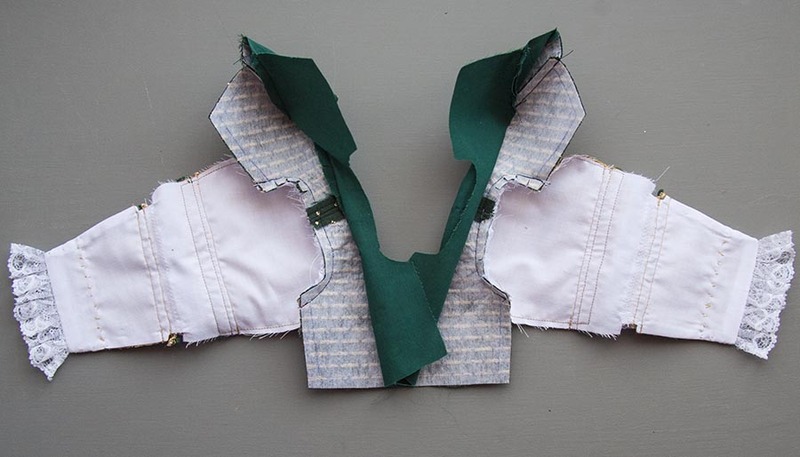 Clip lining armhole seam allowance, fold in to inside. 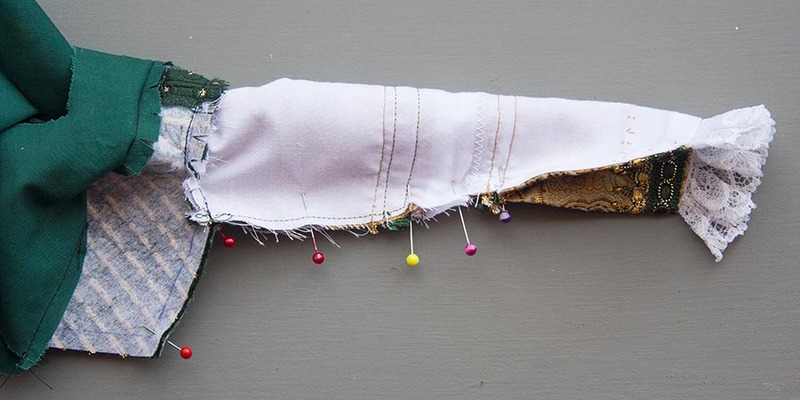 To make the next step easier, baste the clipped edge of the armhole in with a matching thread. Then turn the lining right side out, and insert bodice sleeve into position. Hand stitch the lining around the armhole. 18. 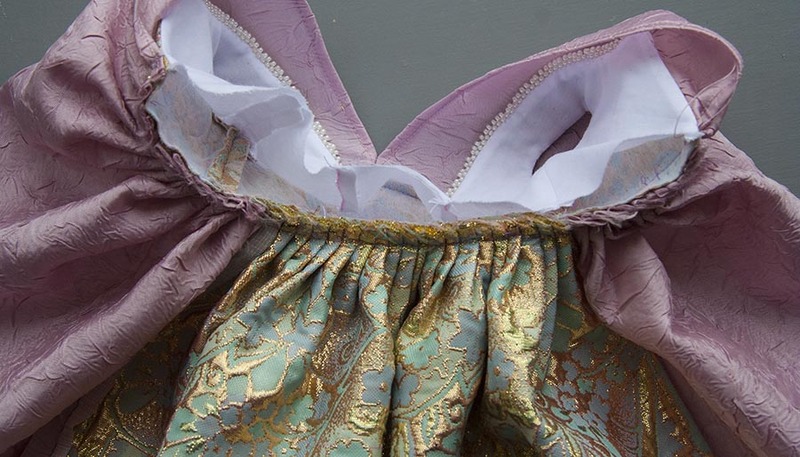 Turn bodice right side out. Time to attach the skirt. 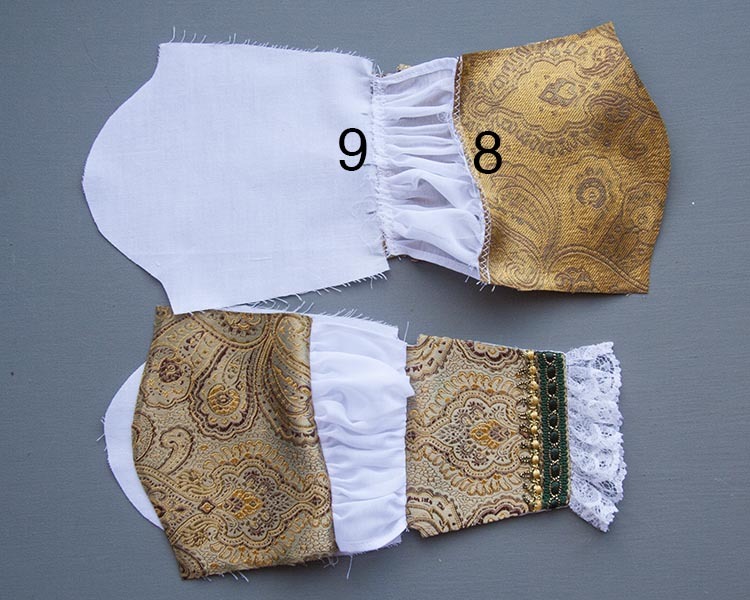 Using the same technique as explained for the underdress, divide the bottom edge of the bodice into eights. 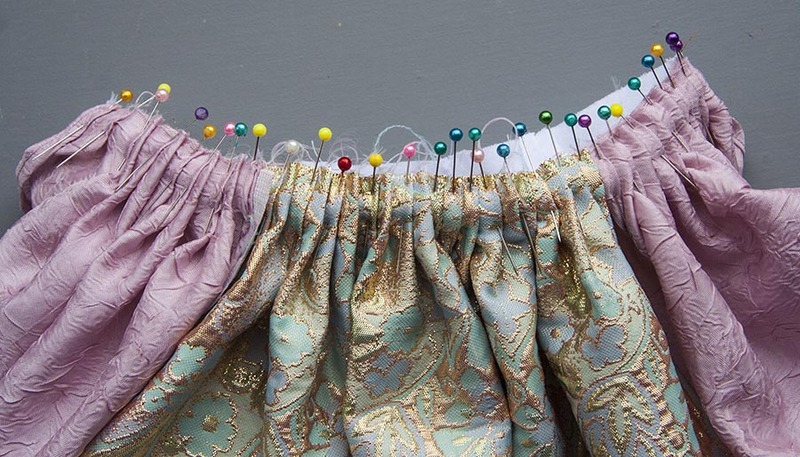 Divide the top of the skirt edge into eights as well, and match up the pins. Pleat the skirt fabric onto the bodice, securing with pins. 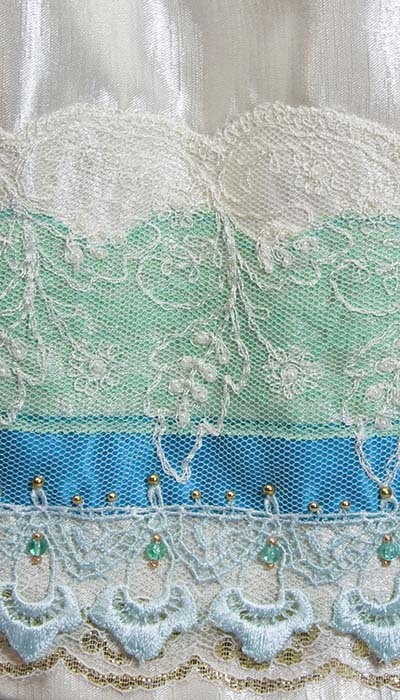 Hand baste, then machine stitch. 21. 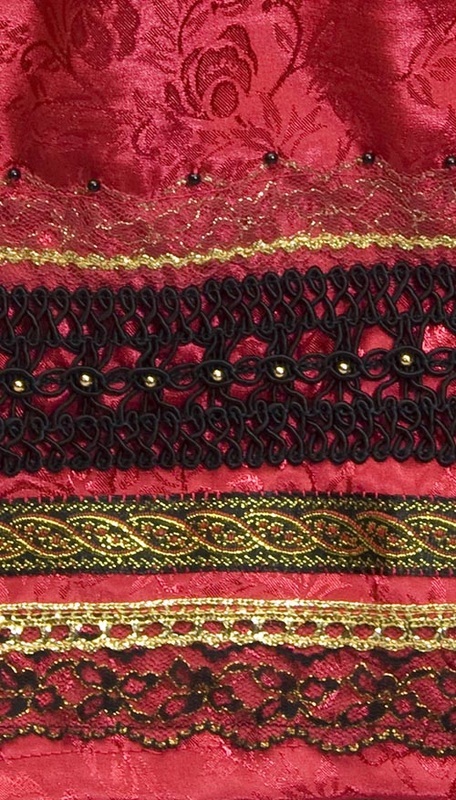 Hand-stitch trim around front edge opening of dress. Then insert eyelets. 25. 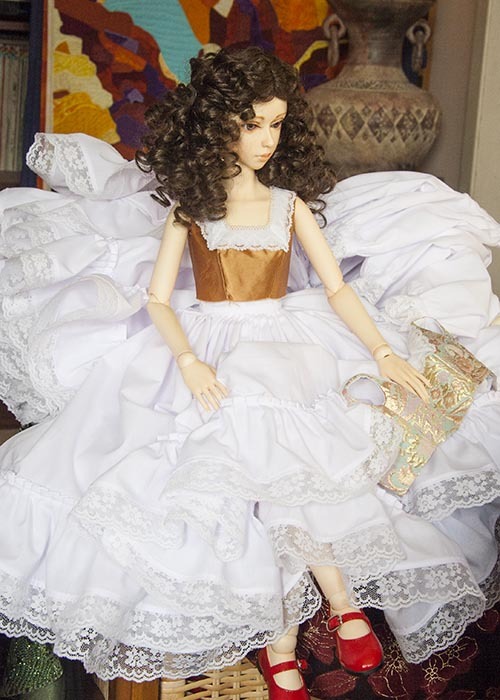 To give the underskirt some more fullness, I sewed ruffled petticoats out of white cotton edged with lace. 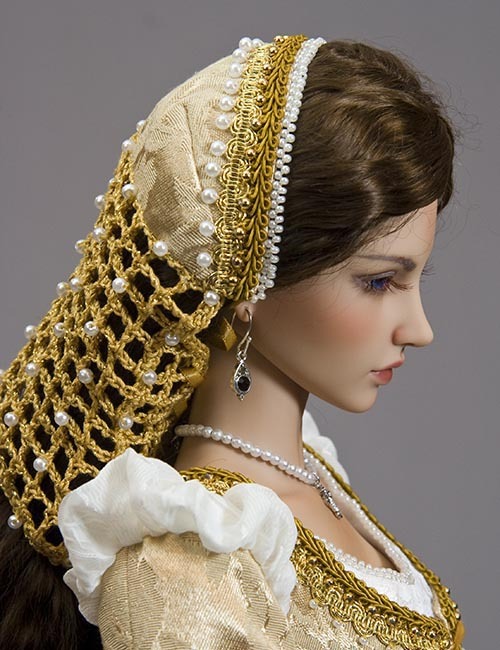 They aren't historically accurate - they would never have 'wasted' lace on underwear. 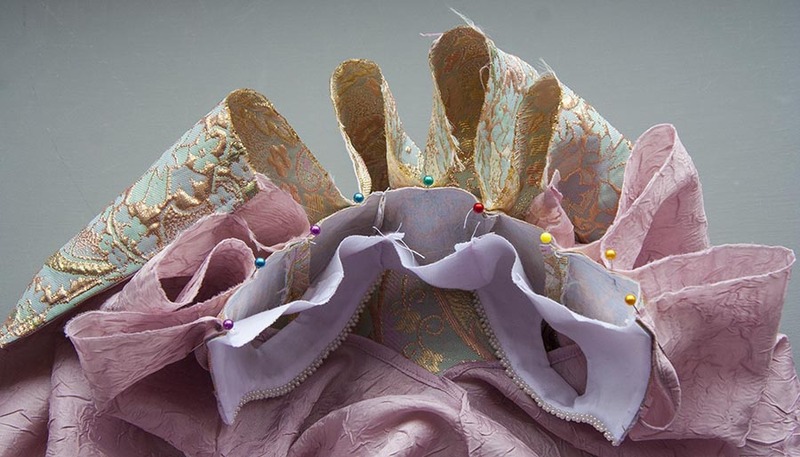 There are no patterns or instructions for the petticoats since they are easy enough to figure out. 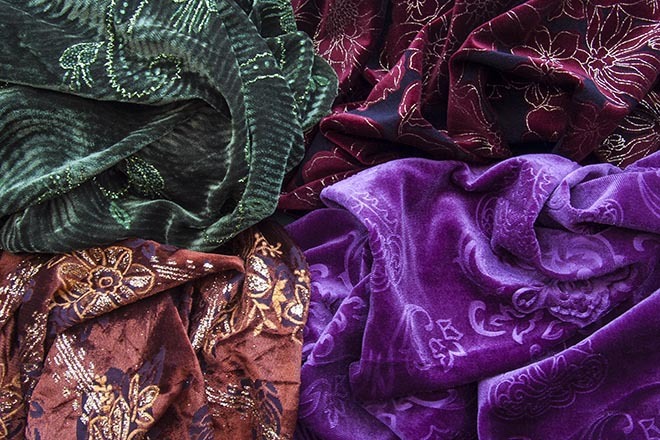 Just click on any of the patterns below to download the full-size three-page pattern pdf. 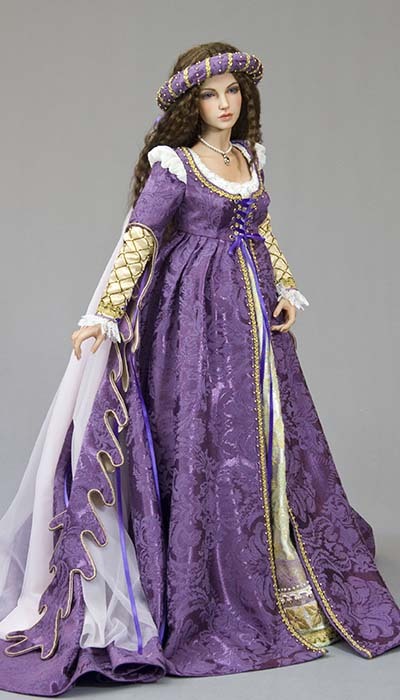 *Important - The overdress with the dagged sleeves is considerably more complicated to make than the Overdress in the Tutorial above. 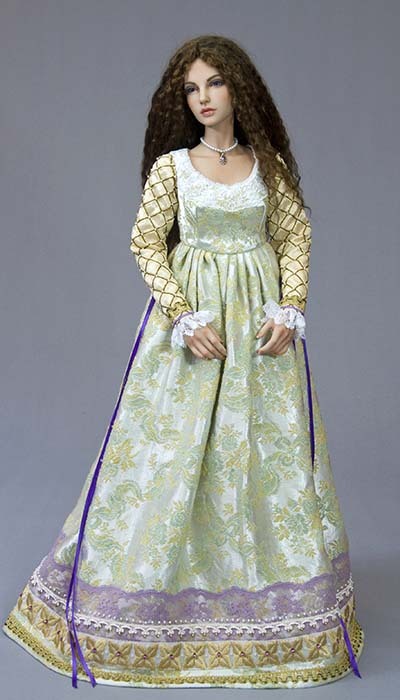 The seam in the dagged sleeves does not correspond to the underarm seam of the bodice. 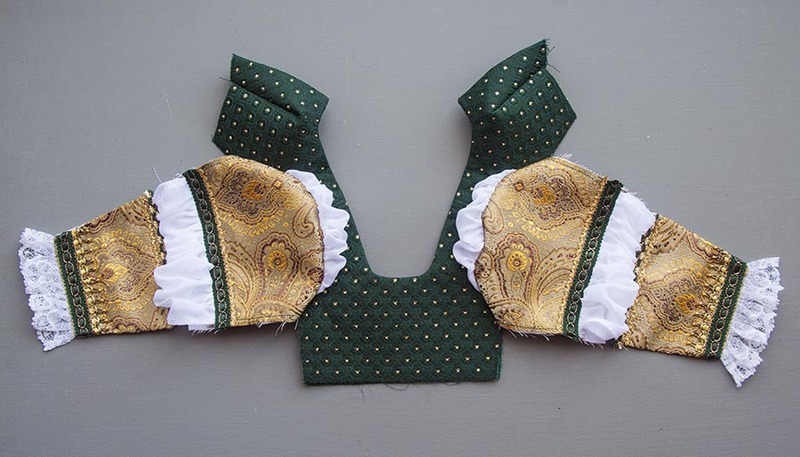 So the sleeves need to be hand-sewn into the armholes after the bodice underarm seams have been sewn. I don't have any 'under construction' photos to help with the directions, so I'm hoping that I can explain the process verbally. 1. 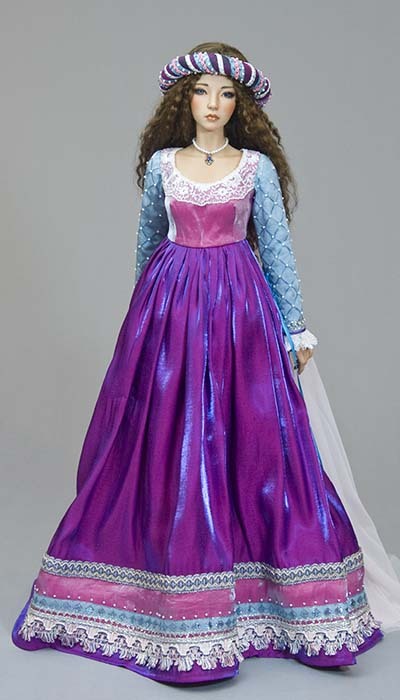 Print out pdf for Renaissance Gown (at beginning of Tutorial) and the Dagged Sleeve Pattern pdf. Cut out the dagged sleeve sections and glue them together. 2. 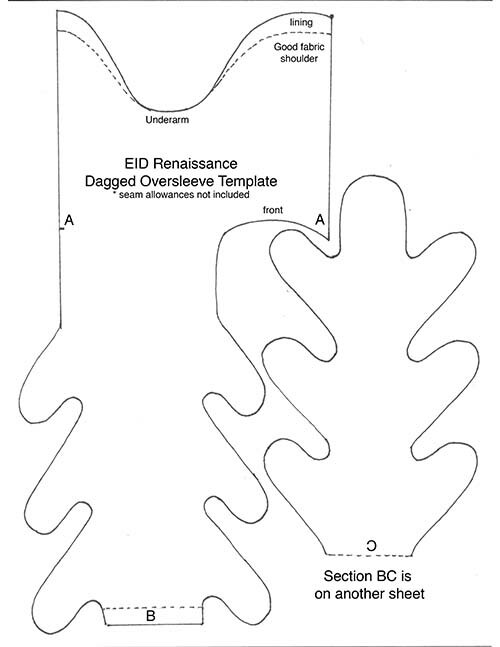 Make the bodice of this underdress, basically following the directions for the Overdress bodice above, and using the Sleeve Lining Template as the pattern for both the sleeve lining, and the sleeve itself. 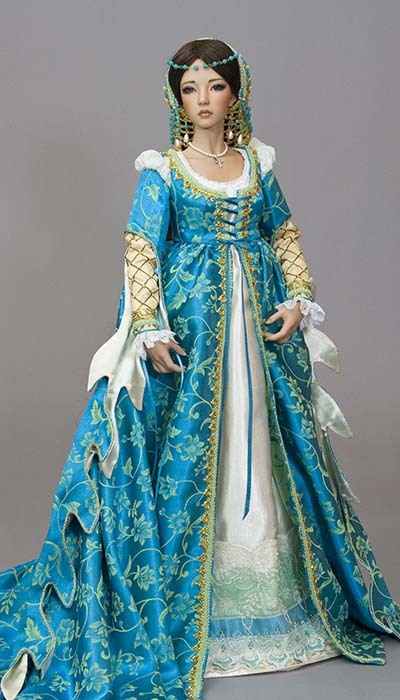 The only difference in the instructions will be that the opening in this bodice is at the back, whereas the opening in the overdress above is in the front. The sleeve is sewn in exactly the same way. 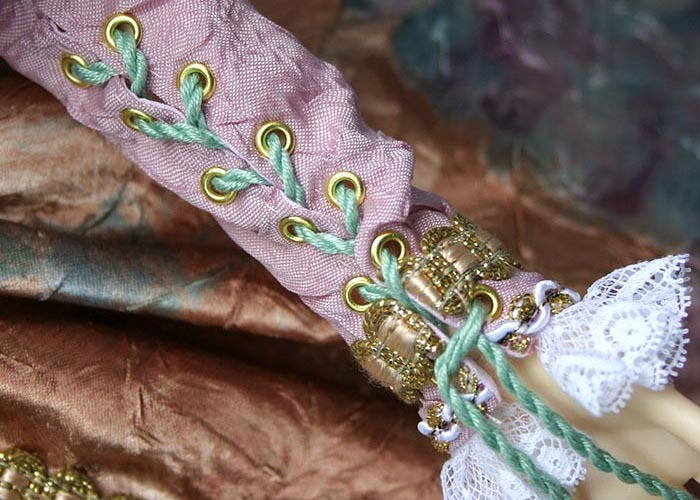 Just remember to leave spaces between the trims at the wrist to allow room for eyelets. 3. 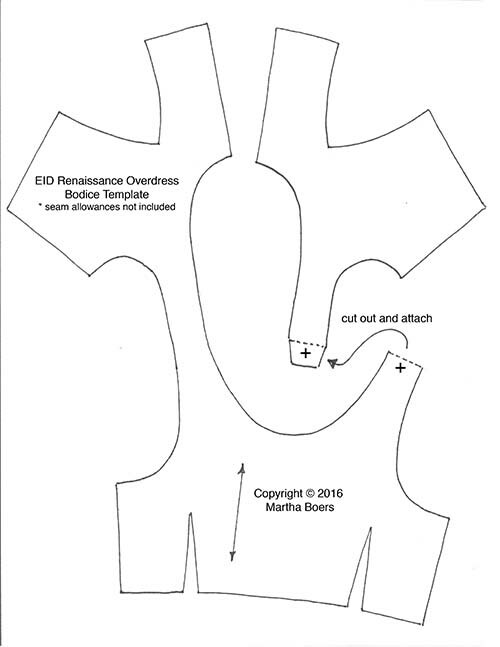 Trace the Overdress Bodice Template onto the non-sticky side of medium weight iron-on interfacing. Add seam allowances and cut out. 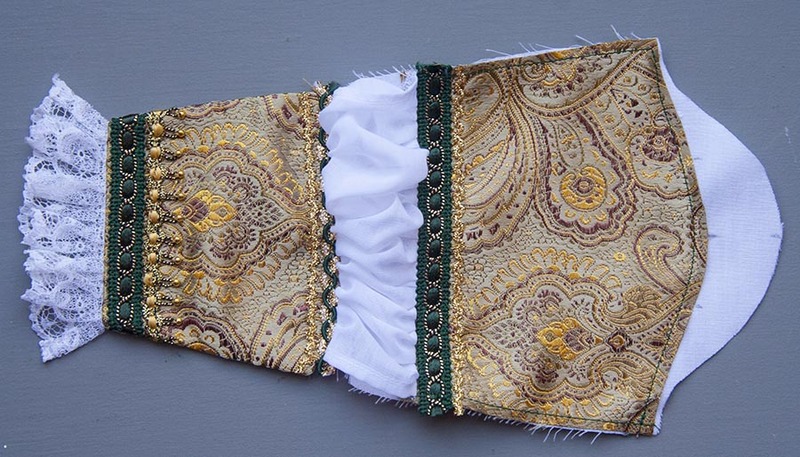 Press interfacing onto the wrong side of your bodice fabric. Cut it out. FrayCheck all the edges. 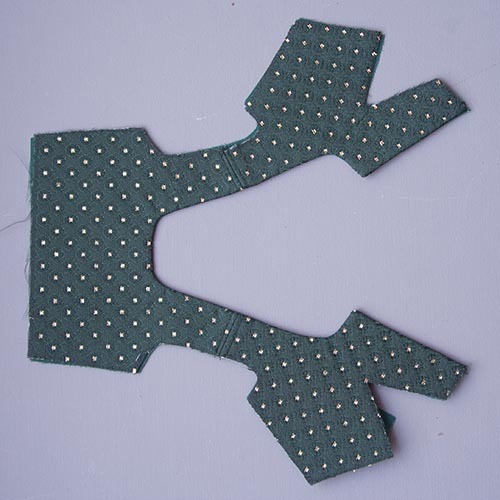 Cut out lining, and with right sides together, sew along the front opening edge, around the neckline, and down the other front opening edge. Clip edges and turn right side out. Press. 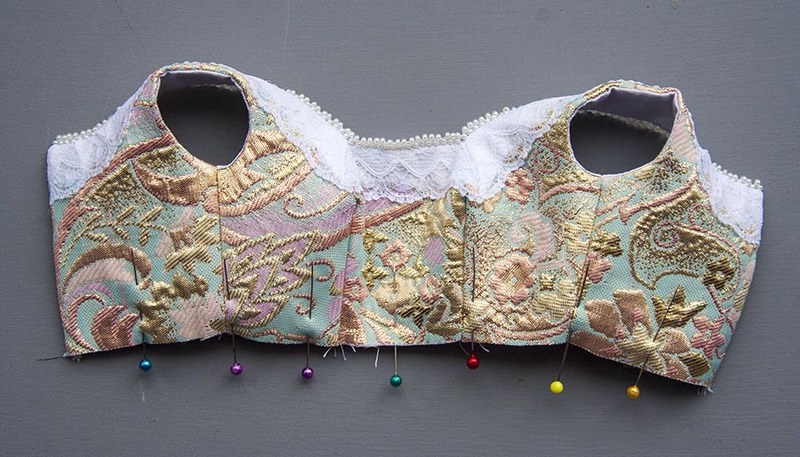 Sew darts, and underarm seams of bodice fabric and lining fabric separately. 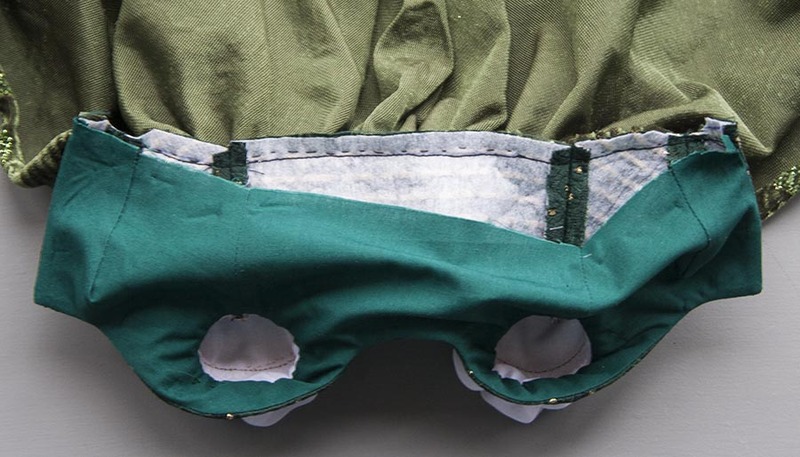 FrayCheck armholes, let dry, clip armhole seams. 4. 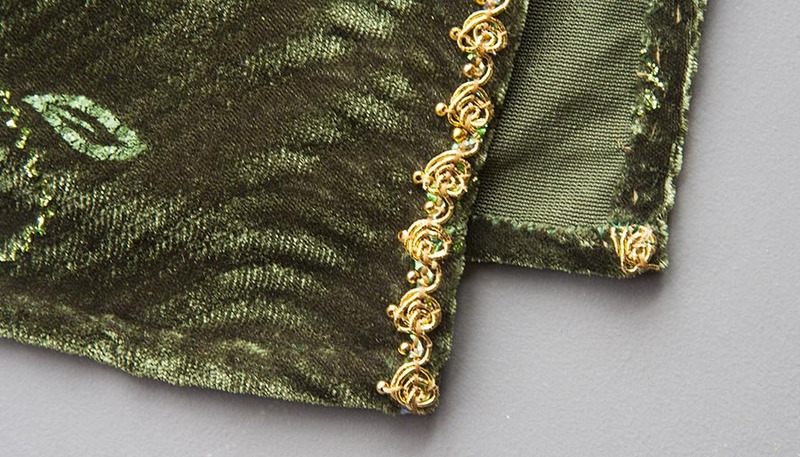 Trace a pair of Dagged Sleeves onto the wrong side of the lining fabric. Mark 'A'. Do not cut out yet! 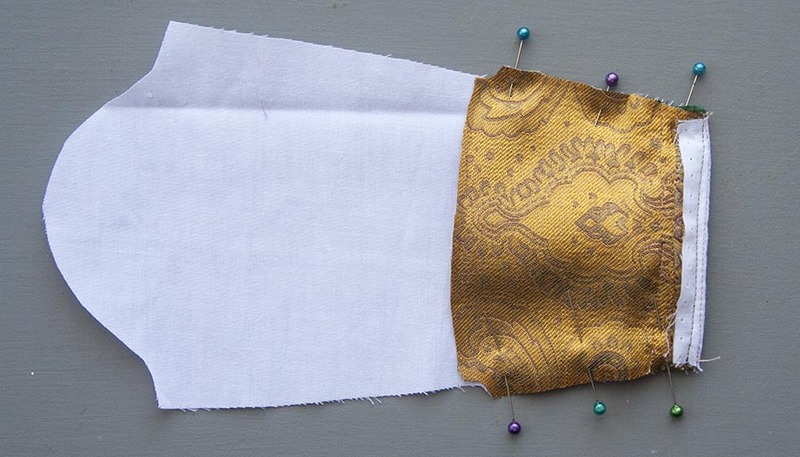 Pin the lining fabric right sides together onto the dress fabric. 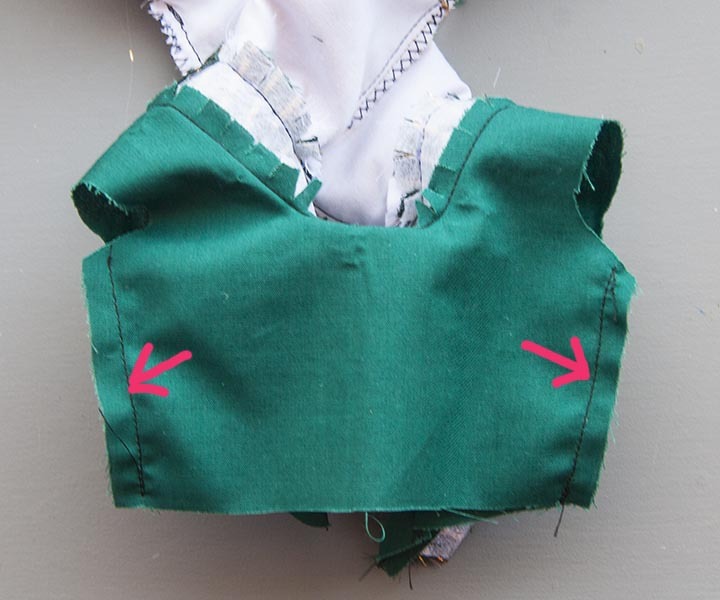 Cut out sleeves through both layers of fabric, remembering to add the seam allowance as you go. 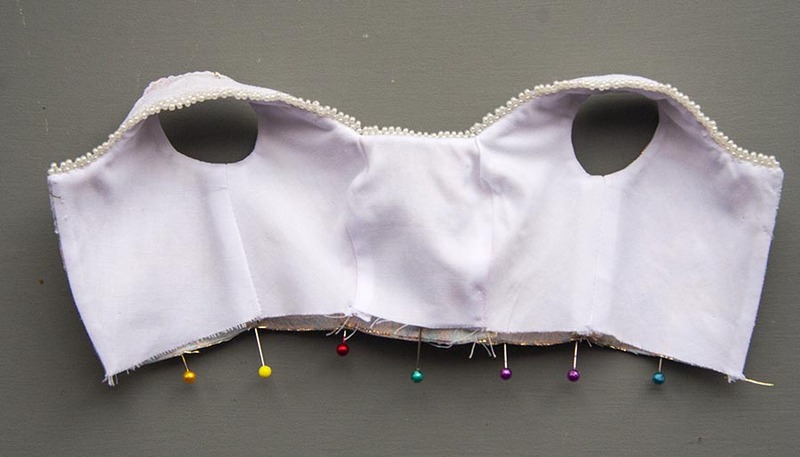 ​ Do NOT remove the pins! 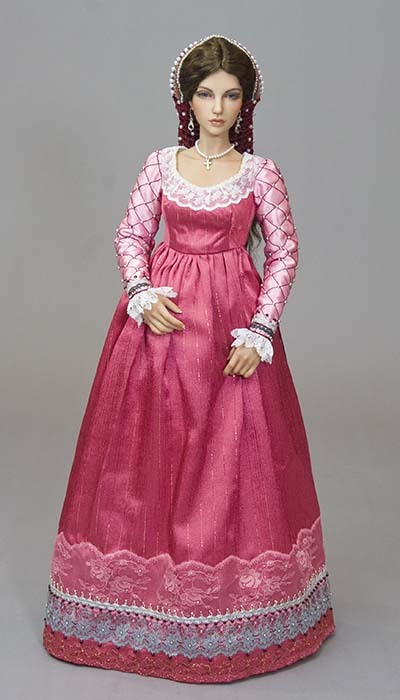 *Note that the dress fabric does not go as high up at the top of the sleeve as the lining fabric does. 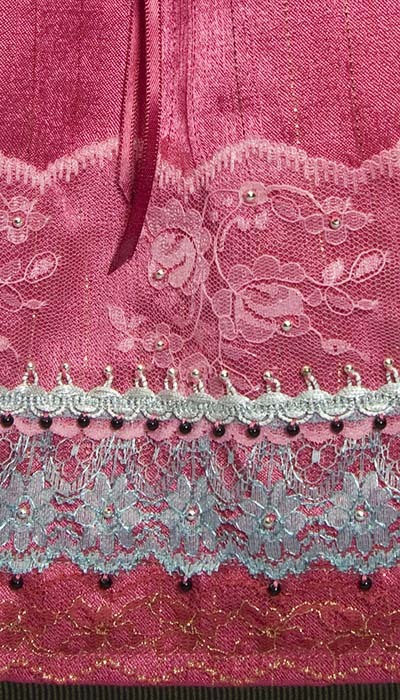 Trim back the dress fabric to correspond to the line on the pattern top. 5. 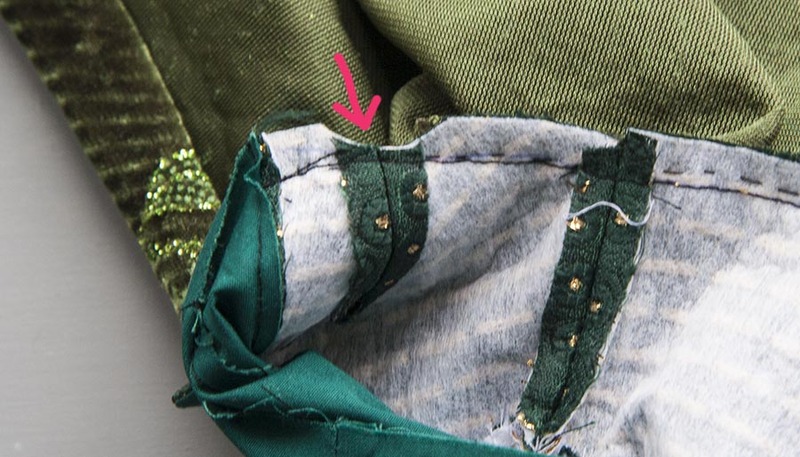 Leaving the entire dagged section of the sleeve pinned together, remove pins from the upper section of the sleeve pieces. 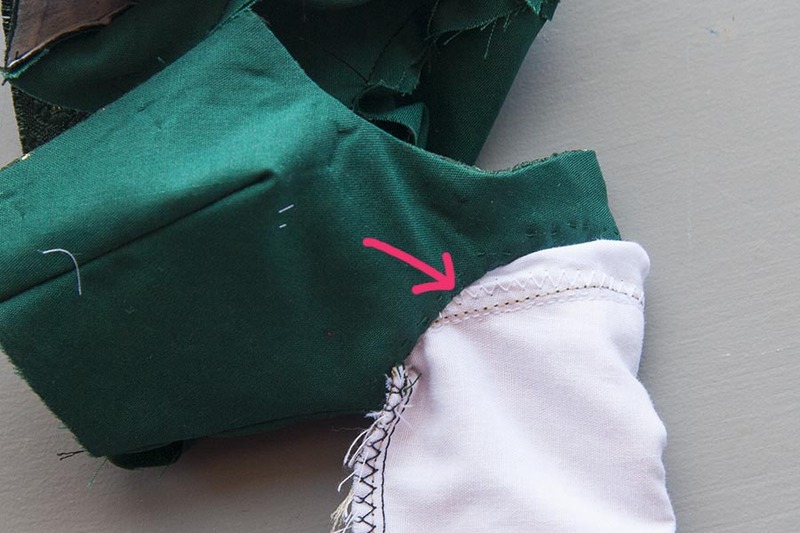 With right sides together, sew the seams from the top of the sleeve down to 'A', on both the sleeve and the lining, forming a tube at the top of both. 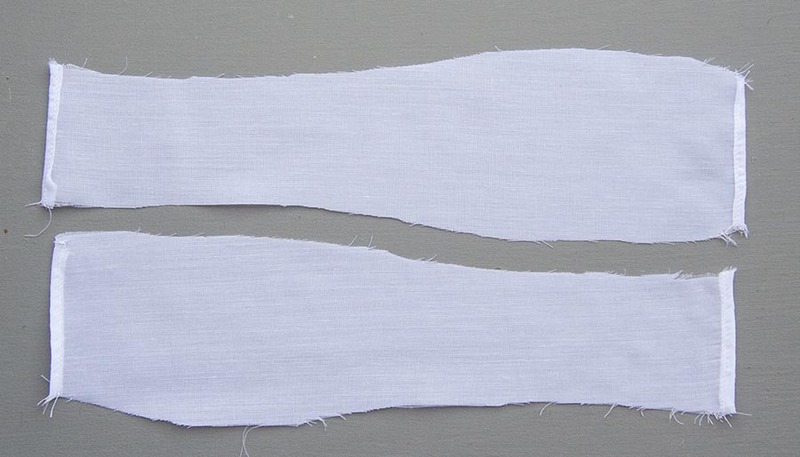 Insert the lining 'tube' into the sleeve 'tube', with right sides together, and finger-pressing the just-sewn seams open, pin the bottom edge of sleeve 'tubes' together. It should now resemble an inside-out hanging sleeve. 6. 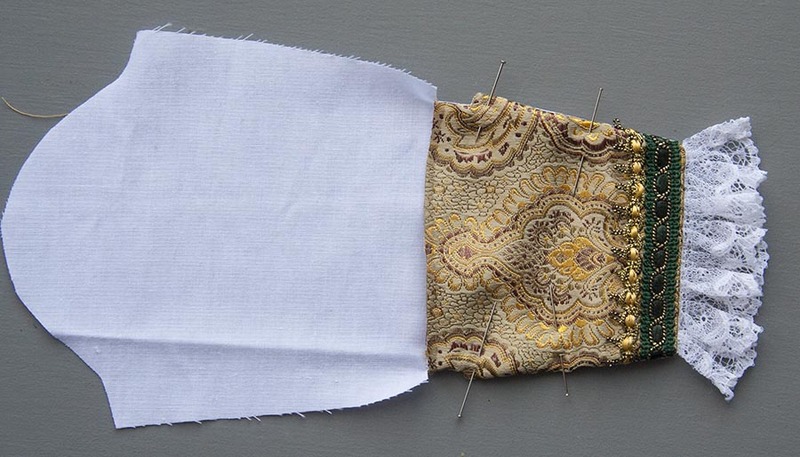 Slowly and carefully, sew the sleeve to the lining, using the traced line on the lining as your sewing line, going in and out along the edges of all the dagging. Carefully clip all the curves. There's a LOT! *The closer together the clipping, the smoother the curves will be when the dagging is turned right side out. Now turn the sleeve right side out, working carefully to turn each dagged section right side out neatly. Insert pins to help hold things flat. Once the entire sleeve has been turned right-side-out, press it. 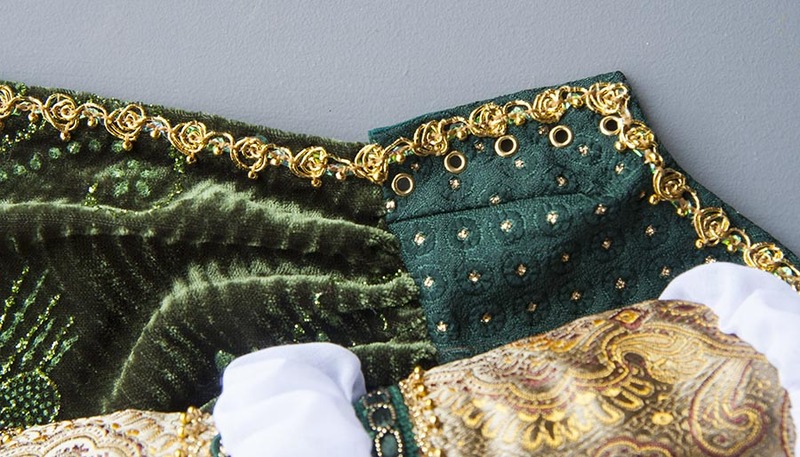 * To help keep the dagged strips flat, as well as to add a bit of embellishment, I embroidered a chain-stitch line all the way around the edge of the sleeve on the good side, being careful to not stitch through the lining. 7. Fold the upper sleeve tube flat, with the highest point (centre of shoulder) on one side and the lowest (centre of underarm) on the other. Mark those points with pins. 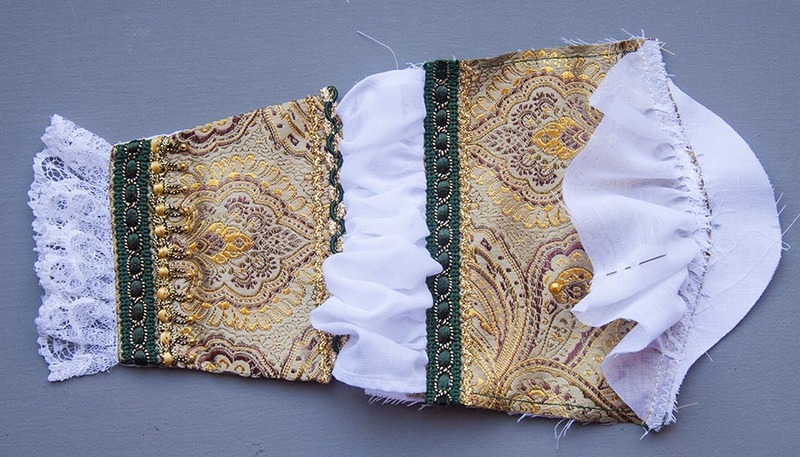 To make the shoulder puffs, gather one edge of each fabric strip onto the top of the outer sleeve (through both layers) below where the sleeve fabric was cut a bit shorter (in step 4). 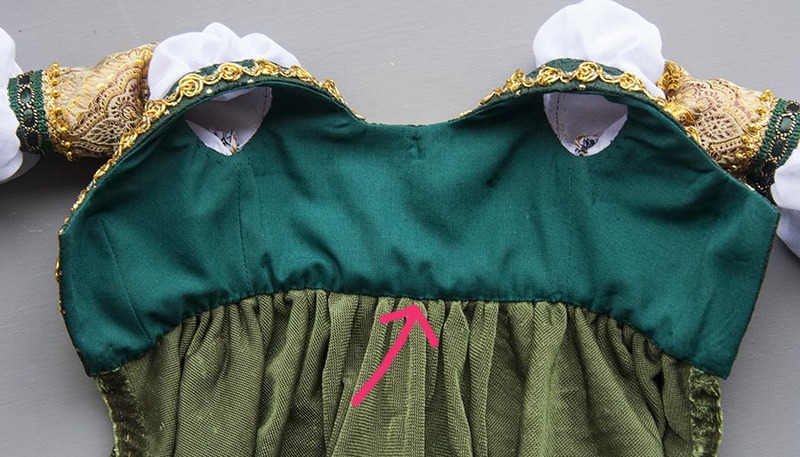 The middle of the puff (at it's widest) goes at the top of the sleeve at the top of the shoulder, and the points taper into the lowest point of the sleeves - the underarms. 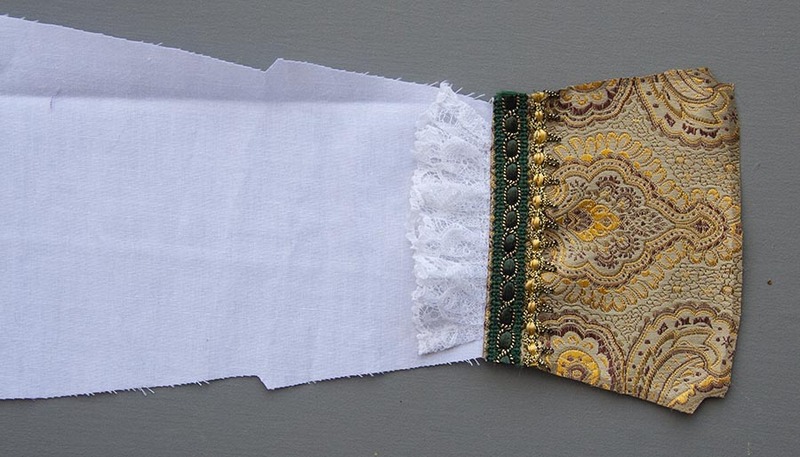 Gather the tops of the puffs onto the tops of the sleeve linings. ​8. 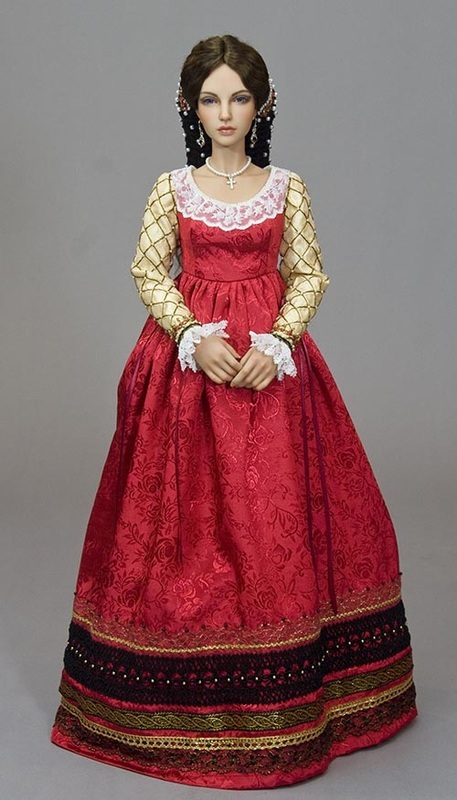 With over-sleeve right side out, and bodice inside out, insert top of sleeve into arm hole with right sides together, matching the top of the sleeve to the shoulder on the bodice, and the underarm of the sleeve to the underarm of the bodice. 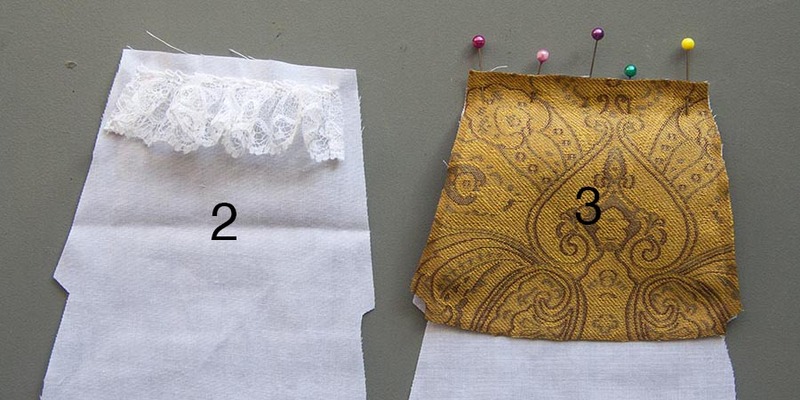 Check to make sure you have the correct sleeve in the correct armhole. 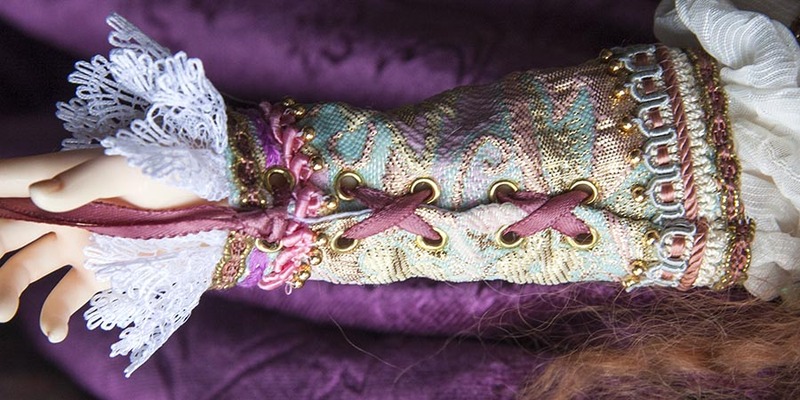 *The vertical seam on the top of the sleeve goes to the outside. 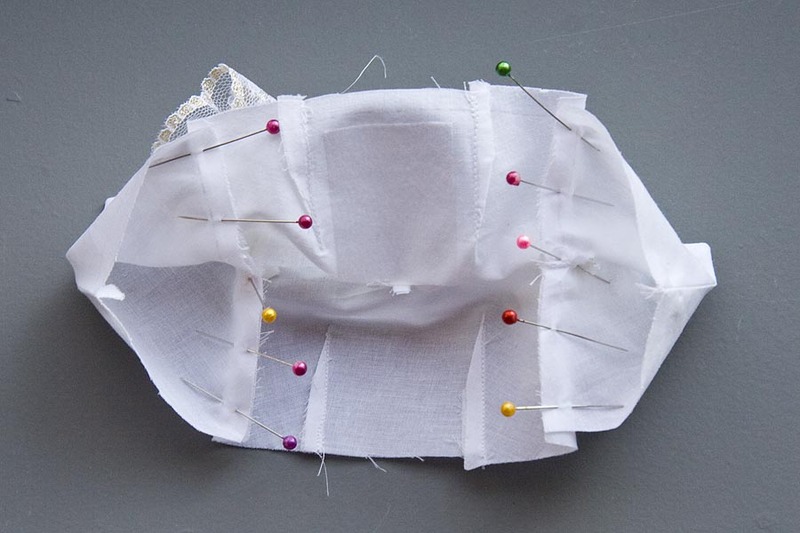 Ease the sleeve to fit into the armhole opening of just the dress bodice (not the lining) and baste into place. If possible, stitch over basting line by machine. Otherwise hand sew securely. Clip seam allowances. 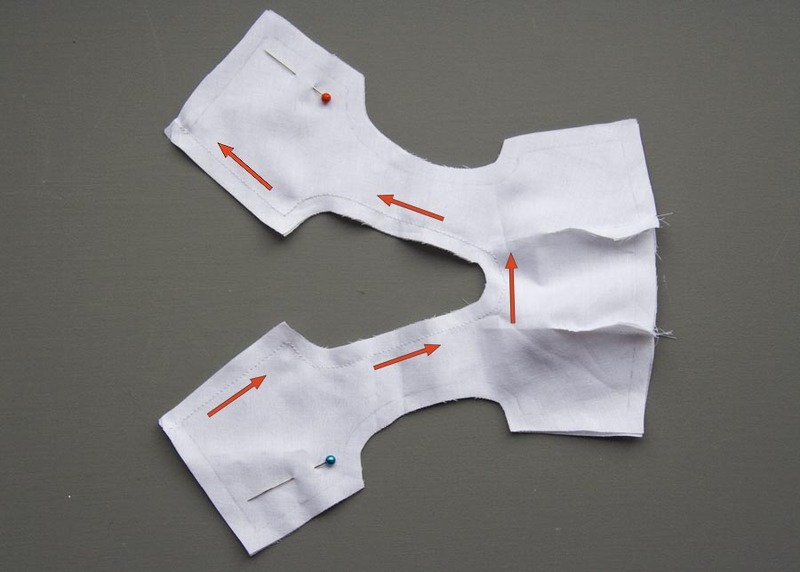 With bodice and sleeves inside-out, fold the seam allowance of the bodice lining to the inside (as in step 17 above), baste edge, slip over inside-out dress sleeve, pin lining into place around sleeve, and hand-stitch lining into place. Turn right side out. 8. 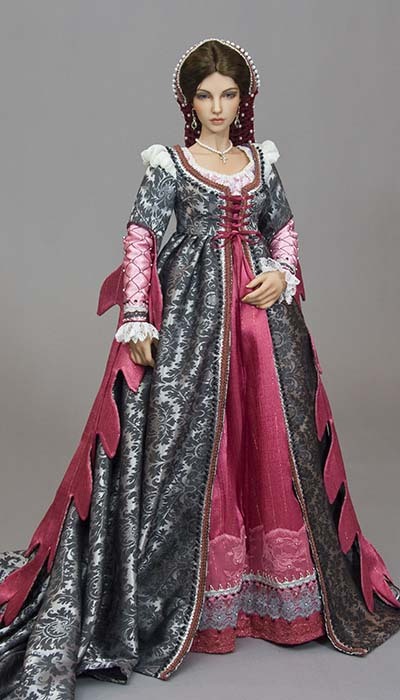 Attach skirt and finish as in steps 18 to 23 above. Congratulations! You are done!! 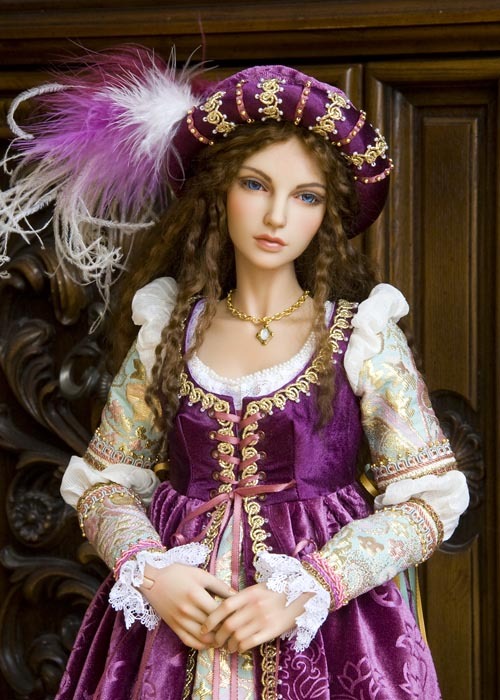 Now it's time to put the entire costume on your doll, lace it up, and admire your handiwork! 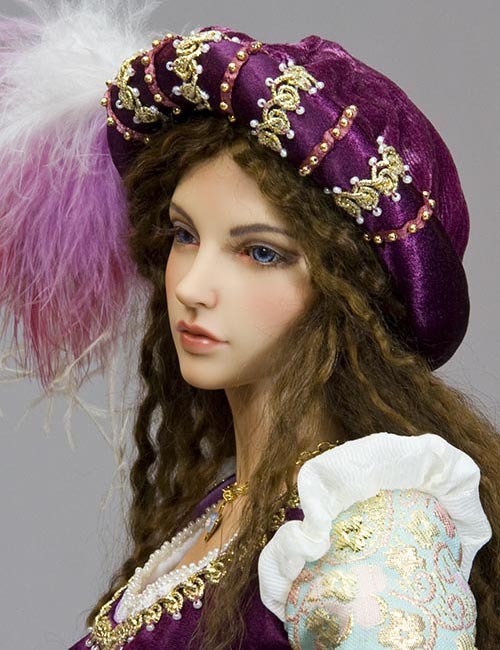 ​To make a hat or headdress to go with your doll's new dress, check out the Renaissance Hats Tutorial!